When Whitworths recently contacted us to see if we would like to test their range of snacks, I jumped at the chance. As I'm sure any parent is, I'm always on the lookout for healthy snacks which are just as enjoyable as sweets or biscuits. Whitworths have a great range of products which are fun for kids whilst also being healthy. First up we have Frootz, "Frootz high fruit buttons are the perfect option for when you want to give your child a tasty snack." Frootz come in a variety of 9 flavours including strawberry, raspberry, blackcurrant, apple, orange, lemon strawberry yoghurt and new flavours pineapple and banana. Frootz are exactly as they describe, large fruit buttons. They are made with 80% fruit but taste very sweet. So for your picky eaters its easy to say they are sweets. The frootz do contain sugar but are low in fat and free from artificial flavours, colours and sweeteners. Jack loved each of the flavours and they were perfect for snacking on throughout the day. Next we have Sunny Raisins, "Sunny Raisin is just what you imagine - wholesome, fruity goodness that mums and dads can trust." 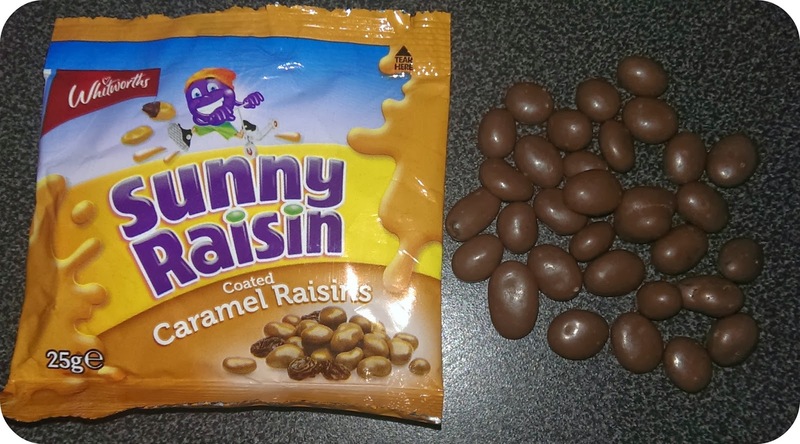 As well as the original sunny raisins, there are also a range of 5 coated raisins. Coasted raisins include chocolate, yoghurt, custard, caramel and milk & white chocolate. All of these again were a big hit with us, we regularly enjoy yoghurt raisins so was lovely to try others coatings. The chocolates ones are perfect for a small chocolate fix. Each of the Sunny Raisins and Frootz come in lunchbox sized packs. So they are also ideal for snacks on the go. The sunny raisins come in a 25g bag whilst the frootz are in an 18g bag. 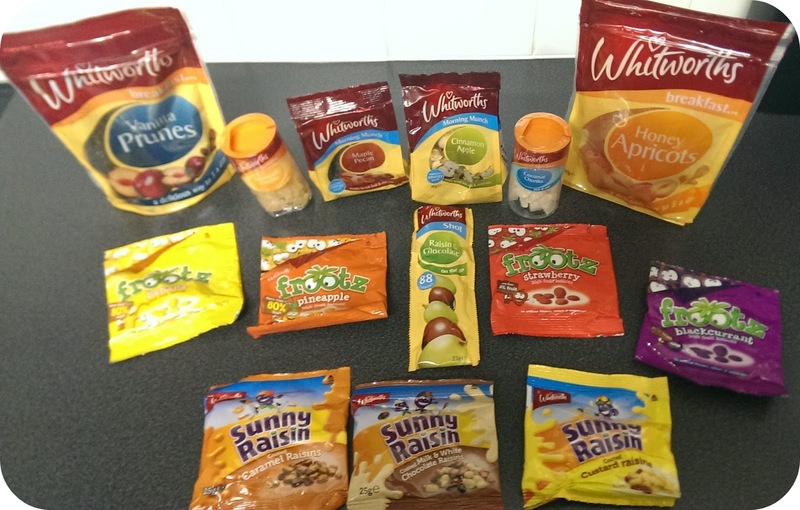 Within our package of healthy snacks, we also received some products from Whitworths new breakfast range, which is more suited to adults. As I've stated many times, very rarely do I have breakfast so these are perfect for me as they are designed for busy people or on the go. We received a selection of shots, flavours, sprinkles, and morning munch. Whitworths shots are a range of 4 products which aim to provide a quick tasty snack on the go. All of the shot products are less than 100 calories. We received a pack of raisin and chocolate shots which are 88 calories. They consist of a range of golden raisins, crimson raisins and plain chocolate balls. I found these a perfect mid-morning snack. Next is the morning munch, these come in 6 varieties, these combine a mix of fruits, nuts, seeds and indulgence. We received the cinnamon apple and maple pecan. These all come in 70g packs and are perfect to graze on throughout the morning. Next are the sprinkles, coming in 12 different pots these are designed to be sprinkled on your everyday cereal. There is a wide range which looks interesting, however I am yet to try the ones we received. We then have the flavours, these come in 4 varieties of fruit each to which are infused with a different flavour. Combined they are a fab way to eat functional fruits and help get your 5 a day. Also within the range are toppers, these are simply designed to liven up your porridge, yoghurt or cereals. You can find out more about all of these products on the Whitworths site here. Please Note: We received a variety of samples for the purpose of this review, all opinions are my own.